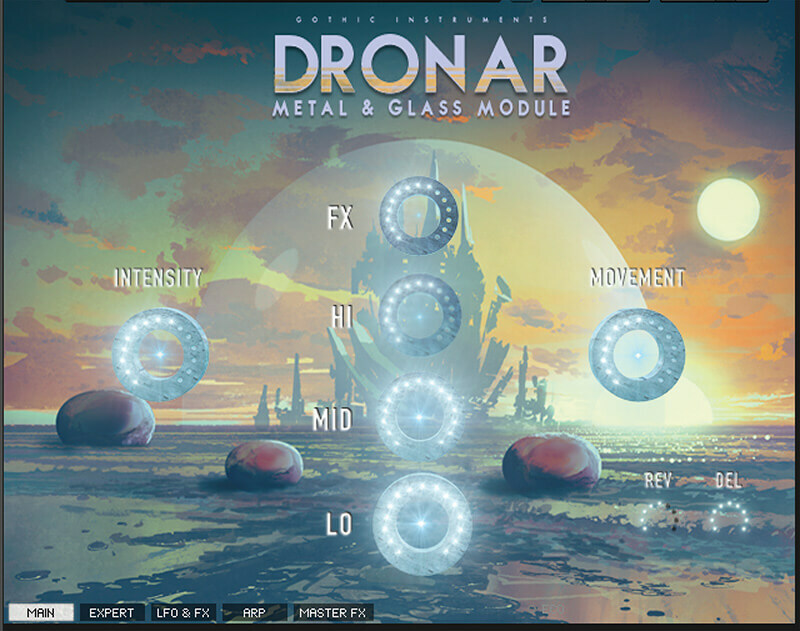 Dronar’s concept is simple and quite unique. 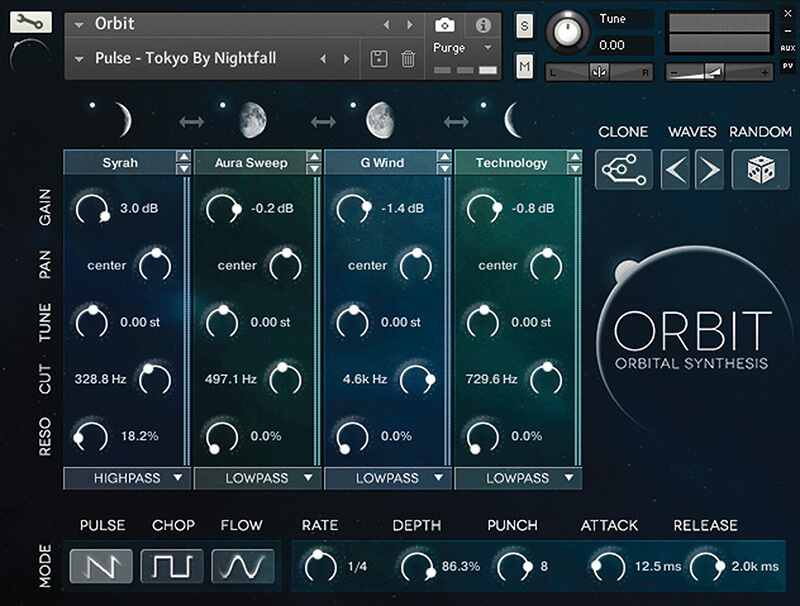 It uses a modular approach with individual software titles that concentrate on specific sonic areas, and all of these are pretty competitively priced (usually around £60 each). 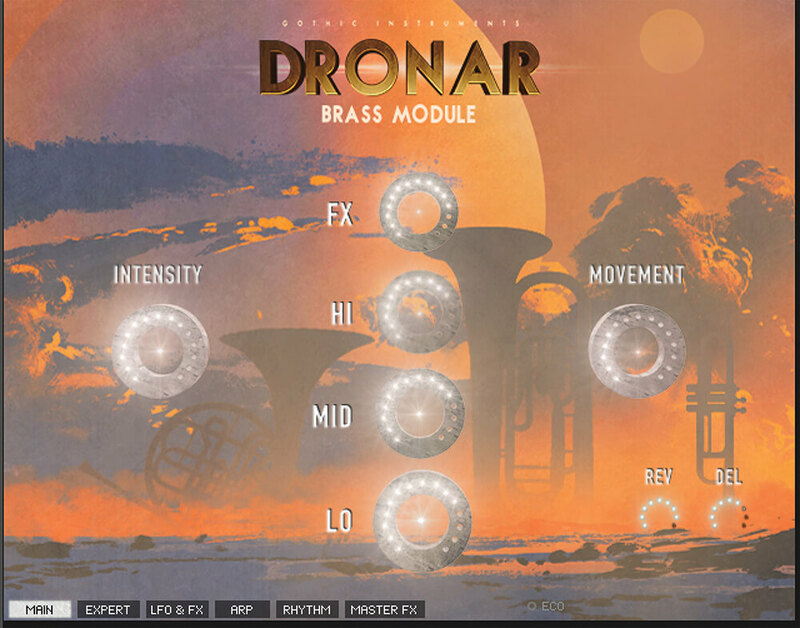 You simply choose modules – as and when they are released – to create your modular Dronar collection. I looked at the first instalment, Hybrid, a couple of years back and now have the most recent two chapters in to review. I didn’t initially think I was the right person to test the first of these, as it’s got the word ‘brass’ in the title and I’ve had a long battle with technology trying to recreate brass sounds since my first synth’s pathetic attempts back in the 1980s. However, the Dronar concept is not about recreation – it’s about manipulation and atmosphere. Hybrid, for example, was full of menace and it was dead easy to create loads more with dramatic on-screen controls. Both Brass and Metal and Glass weigh in at around 5GB a pop, which is by no means large in this day and age, but remember they are modules and part of a bigger picture. You use Time+Space’s excellent Connect software to download them in smaller packs of data which automatically unpack in your chosen location – just remember to trash the original .RAR files. Both collections require the full, up-to-date version of Kontakt (I had to dip into Native Access to update mine). They also don’t just load into Kontakt as many NI libraries do – you’ll need to access the instrument .nki files via the Files tab to load them in. As Time+Space admit, this can be a faff if you want to go back and forth between libraries and files, so Kontakt’s Quick Load feature, which lets you get easy and fast access to your favourite folders and sounds, is recommended. There’s a good YouTube video that shows you how to do this, but it is pretty easy. These are also big sounds and big presets and my computer struggled initially, but tweaking of the buffer size in Logic helped. I’d probably recommend having a machine with 16GB RAM just to be on the safe side (mine is just about to be upgraded from 8GB) and you might want to render to audio once tracks are laid down. But these are big sounds for a reason: they’re very good sounds, the kind where just one note might give you an entire soundtrack because, as we’ll see, there is a lot going on within each one. We’re in familiar territory loading up both modules. Brass is (kind of) brass coloured and features the Intensity and Movement dials, which made such an impact with Hybrid Module, plus FX, Hi, Mid and Lo dials. Metal and Glass features a much cooler futuristic landscape but includes the same controls. Dialling up Intensity (also assigned to your mod wheel) racks up the power of different velocity layers and is quite OTT in practice – like different sounds seeping up from their intended layers. Movement brings in more arpeggiation action as its name suggests. Each Drone has four layers, each with two different samples. The Hi, Mid and Low dials are not, as you might think, EQ. They control the level of the instruments within those Drone layers but as the samples here tend to be low, mid and high frequency in nature, the effect is often like a glorified EQ. The FX dial controls the fourth layer which has sound effect loops within it. So you see, even on the top level, each module has a lot to edit the samples that make up a Drone, and that’s why they are so huge! But there’s more because in both modules there are further options to let you get further beneath your sonic bonnet. The Expert page allows you to change the two raw samples within each of the four layers and also has filter, tone and shaping options. There’s an LFO and FX page which lets you add more movement and also includes Distortion, Chorus, Reverb and Delay dials. The Arpeggiator page has some very creative Pitch, Intensity and Filter options to really knock your sound around the park, adding yet more evolving movement. Finally the master FX page allows overall EQ, compression, delay or reverb to be added – like you didn’t have enough effects already! So what do these modules sound like? Brass is, thankfully, nothing like Brass. Instruments are split into multi-Drone setups or you can load in individual Drones. They’re broken down into pads, leads, arpeggiations, basses and rhythmic presets. There are also folders called Dark and Complex Future. The first contains detuned and terrifying stuff, groans and alien monster sounds. Complex Future? Well that’s full of industrial sounds that can and should be used in the next Blade Runner film. Elsewhere in Brass there are tense strings, stabs of twisted and scrunched up (presumably) brass recordings, lots of eerie pads and, not unexpectedly, loads of presets with raw, evolving movement. Onto Metal and Glass and it’s more of the same, but different. There’s atmosphere in spades, again, but here the emphasis is truly off-world. Instrument categories again cover bass, arps and pads but there are also additional folders like Inspirational, Danger, Chaos and Horror. The results here are, to borrow one of those titles, truly inspiring. There are pads to die for, some simple, some more complex (and actually the simpler ones often work the best). My favourite set is Modulated Cities, which contains vocal-like pads, huge ghostly walls of sound, swirling industrial slabs and a preset called Noise Wall which is the most thunderous ‘Quick, make a tune!’ wedge of beauty I’ve heard in a long time. There’s a lot more and this is probably the best of the three or four Dronar modules that I’ve looked at. But I do love my atmosphere and movement. If you’re like me in that respect, £59.95 will take you to any planet you want. A quick note on some of the extras I mentioned earlier. There’s every chance you’ll be too blown away with the sounds to delve too deeply, but the Arpeggiator and Filter options really are great fun so do give those a go. Do you compose music for film or TV? Do you make weird atmospheric or terrifying music? Do you need atmospheric backdrops or produce ambient compositions? Maybe you want to add some subtle atmosphere to pumping techno to make it different from the norm? If any of these applies then you do need one or two Dronar modules in your life. 60 quid for this much sonic power is peanuts. If there is any criticism to be levelled at the Dronar series it’s that it is specifically designed for creating weird, out-there sounds. But there is a lot of variation within that word ‘weird’ and, as I say, these can be used for a variety of sonic purposes. For me, it’s what you can do with the sounds that is key as you can take them anywhere you like, even making them less weird should you choose! 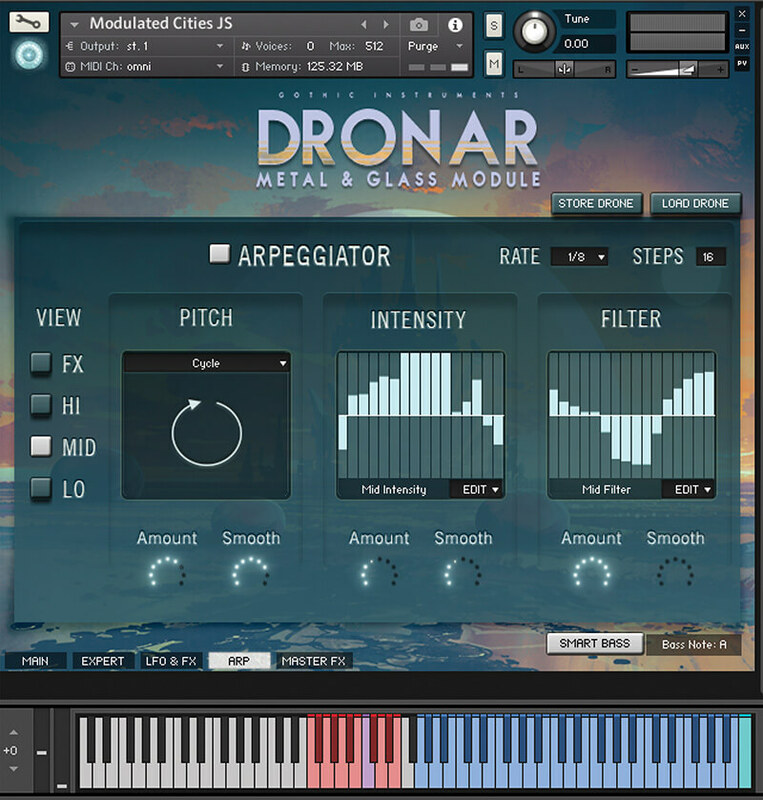 And those extra synthesis options not only add huge flexibility, they are very easy to implement and get your head around – Dronar’s modules produce hugely complex sounds but they are not complex to use and abuse. And I don’t want to drone on and on about the price, but to get them for less than 60 quid a pop beggars belief for the power you get. Turns out that Brass can sound great after all! 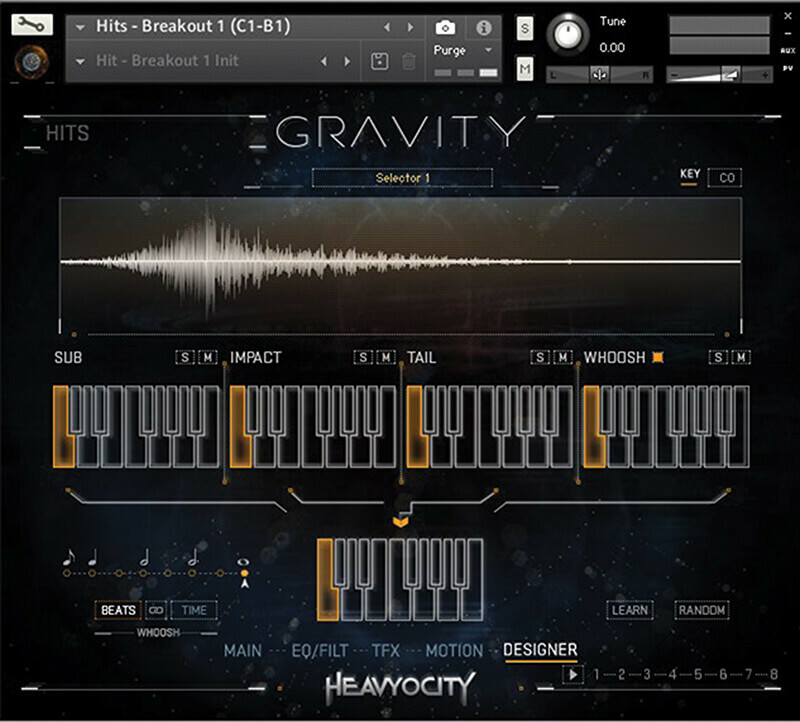 It seems like silly money in comparison – and it is steep – but Gravity offers a very similar set of sonic tools (if not, more of them) to really get some evolving atmosphere. Think of it as a bunch of modules – in one to make the price easier to handle.